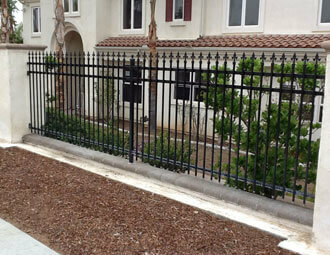 For over 30 years, Advance Iron Works has provided beautiful, high quality property fences to residential and commercial customers throughout Southern California. Our thousands of satisfied Inland Empire, Riverside County, and Palm Springs area customers appreciate our excellent craftsmanship and our affordable pricing. Our expertly crafted and installed fences comply with all relevant municipal building codes and all homeowners association CC&Rs, and are available in both practical and functional or elaborate and highly decorative designs. Our skilled, experienced craftsmen take great pride in providing superior workmanship and elegant design, and always follow the highest standards of professionalism when they are on the jobsite at your home or business. At Advance Iron Works, we can create any style of iron fence to enclose your residential or commercial property, from a simple, standard iron fence to a custom-designed, highly ornate iron fence. Most residential property fences are designed to enclose a yard, but we can also make fences for pet enclosures, gardens, or decorative purposes. We also build and install pool enclosures, in strict compliance with all applicable UBC and municipal codes. In addition, we can also turn your existing property fence into a privacy fence by attaching a privacy screen to it. Privacy screens are constructed of perforated metal, and do not block airflow through the fence. Iron fencing is also the perfect addition to extend the height of existing brick walls. We can custom-design iron toppers for a brick wall, or provide iron fencing for installation between brick or block columns, and will work in conjunction with the contractor that performs the brick or concrete block work to expertly anchor and install the iron fencing to the masonry. At Advance Iron Works, we believe in excellent customer service, and work closely with our valued clients during every stage of their project. Please give us a call today and find out how a beautiful, functional Advanced Iron Works property fence can add value and curb appeal to your home or business.